Researchers at the University of Southampton have developed a model which explains how the spin of a pulsar slows down as the star gets older. A pulsar is a highly magnetised rotating neutron star which was formed from the remains of a supernova – an explosion which happens after a massive star runs out of nuclear fuel. A pulsar emits a rotating beam of electromagnetic radiation, rather like that of a lighthouse. This beam can be detected by powerful telescopes when it points towards and sweeps past the Earth. 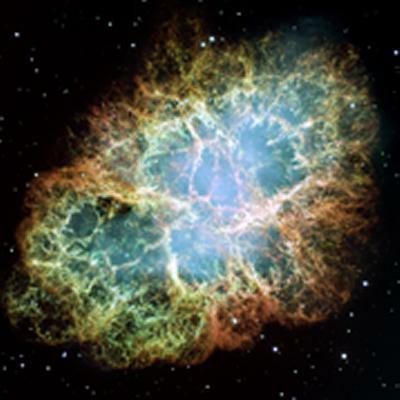 As a hot pulsar cools, its interior increasingly begins to turn superfluid – a state of matter which behaves like a fluid, but without a fluid’s friction or ‘viscosity’. It is this change of state which gradually affects the way that the star’s rotation slows down. The Southampton scientist’s findings have important implications for the next generation of radio telescopes being developed by large international collaborations, like the Square Kilometre Array (SKA) and the Low Frequency Array (LOFAR), of which Southampton is a UK partner university. The discovery and monitoring of many more pulsars is one of the key scientific goals of these projects. Professor Andersson and Dr Ho’s mathematical model can be used in conjunction with these observations to predict how a pulsar’s rotation will change over time and enable scientists to peer inside these stars and explore their exotic composition. "Our results provide a new method of linking the study of distant astronomical objects to laboratory work on Earth in both high-energy and low-temperature physics," says Professor Andersson. "It is an exciting example of interdisciplinary science."